Then in 1993 during the trial of Colin Leat, who was convicted of murdering his three-year-old stepdaughter Leanne White, the trial judge criticised the County’s Social Services for having failed to protect Leanne, despite repeated calls from relatives and neighbours. These and other cases beg the question why is Nottinghamshire suddenly interested now, when there has been a recognised history of failure in this area? Just how independent are the public bodies which have a statutory duty to protect our vulnerable children, and are they fit for purpose? Even before the County and City Council investigations, Nottinghamshire Police had already set up Operation Daybreak to look into the matter. 80 complainants who attended five homes, including Beechwood, in Mapperley, have come forward. Now that we have set the scene, let’s commence our investigative journey by returning to 1992 and reminding ourselves of the changes to our system of governance as a result of the United Nations Agenda 21 Treaty. With a view to strengthening the role of non-governmental organisations as social partners, the United Nations system and Governments should initiate a process, in consultation with non-governmental organisations, to review formal procedures and mechanisms for the involvement of these organisations at all levels from policy-making and decision-making to implementation. In other words, in all aspects of our lives, decisions are now being made and implemented by governance structures that include Public Authorities, but also include so called Third-Sector Charities. One of those Third-Sector Charities is Common Purpose. Definition of the Common Purpose EffectWe have long stated that by blurring the boundaries between people, professions, public and private sectors, responsibility and accountability, Common Purpose encourages graduates to believe that as new selected leaders, they can work together, outside of the established political and social structures, to achieve a paradigm shift or CHANGE. They call this doctrine “Leading Beyond Authority”. In doing so, the allegiance of the individual becomes ‘re-framed’ on Common Purpose colleagues and their NETWORK”. – Nigel Cooke, of One Nottingham who was previously working at the Government Office for the East Midlands (Derby Profile 2005). “Matrix”, “Meridian” and “Profile” are all Common Purpose courses. Alison MichalskaAlso of note is Alison Michalska, Nottingham City Council’s Corporate Director of Children & Families, was previously the Director of Children Family and Adult Services at East Riding of Yorkshire Council. In 2008, a report by the East Riding Safeguarding Children Board disclosed that up to 14 members of staff, at Headlands School and Community Science College, in Bridlington, East Yorkshire, had inappropriate relationships with pupils aged 11 to 18. The report highlighted persistent failures to protect pupils at Headlands over 13 years to 2004 and criticised management standards during that time. Research has uncovered that Alison Waller and Alison Michalska are the same individual. Perhaps more relevant is the fact that, whilst Area Director, Social Care & Health with Birmingham City Council in 2001, Alison Michalska became a Common Purpose Matrix Graduate under her previous incarnation as Alison Waller. – Mike Khouri-Bent, Corporate Director for Care Standards, Pathway Care Solutions Business Representative, Board Member of Nottingham City Homes (Common Purpose). In 2011 a report pointed out that “widespread abuse of Nottingham’s council housing system was said to be one of the biggest scandals in the history of the city council”. The housing service was revealed to have wrongly given homes to some employees, their relatives, partners and friends in an Audit Commission investigation in 2009. In April 2005 the management of Nottingham City Council’s housing stock had been transferred to Nottingham City Homes (NCH), a newly formed arm’s length management organisation (ALMO). Nottingham City Council abandoned its investigation into the allocation of council houses. The police did not carry out any criminal investigation and didn’t pursue any cases. One Nottingham works with a range of partners across the City of Nottingham, including the Theme Partnerships, Area Committees and Area Partnerships as well as Nottingham Community and Voluntary Service, Nottingham Equal, Nottingham City Council and many other public and private sector organisations. The Theme Partnerships are leading on achieving the outcomes in The Nottingham Plan to 2020. Current theme partnerships are: Nottingham Children’s Partnership (including the Priority Families Programme), Health and Wellbeing Board, Crime & Drugs Partnership, Housing Partnership for Nottingham, Working Nottingham and Green Nottingham. The Nottingham Plan to 2020 sets the overall strategic direction and long term vision for the economic, social and environmental well-being of the City of Nottingham. It is this Plan which links to the United Nations Agenda 21 programme. Nottingham Children’s PartnershipThe Nottingham Children’s Partnership is one of the One Nottingham Theme Partnerships. The Nottingham City Children & Young People’s Plan 2010-2014 (CYPP), sets out the priorities to be addressed by the Children’s Partnership Board, as agreed by the City Council and its partners. All partners are accountable for the delivery of a wide range of services to children and young people in Nottingham City. Some of these can be delivered better where we work together. The Children’s Partnership Board is the vehicle for that joint working. – NHS Nottingham University Children’s Hospital. Who regulates Nottingham Children’s Partnership? The Partnership is governed by Nottingham Children’s Partnership Board, which is accountable to One Nottingham. One Nottingham is the strategic partnership for the whole of Nottingham and is accountable to the Government for the delivery of key targets for the City. Not only are some members of the Children’s Partnership board also sitting on the One Nottingham Board but Common Purpose graduates are present in both. One surely has to question if this is a healthy arrangement. One of the functions of the Children’s Partnership is to ‘Oversee the Early Intervention Programme and approve any progress reports for submission to the One Nottingham Board’. Nottingham County CouncilMick Burrows was appointed to the post of Chief Executive of Nottinghamshire County Council in April 2008. Mick spent 22 years working in the Civil Service before joining the County Council in 1995 as a project manager in adult learning. He later became a strategy manager in the regeneration service and was subsequently appointed as Assistant Director of the Culture and Community Department in 1999. He became a Common Purpose Matrix Graduate in 1992. Jayne Francis-Ward is the Corporate Director, Policy, Planning and Corporate Services. She leads the County Council’s Transformation Programme and has held a number of roles at the Council, including the position of Assistant Chief Executive, and was appointed to her current post in March 2012. Francis-Ward became a Common Purpose Matrix Graduate in 1993. Jas Hundel, Director of Property, Transport and Environment is a Common Purpose Matrix 2000 Graduate. Nottinghamshire County Council Child Safeguarding BoardLocal Safeguarding Children Boards (LSCB) were established by the Children Act 2004. The Nottinghamshire Safeguarding Children Board (NSCB) covers Nottinghamshire County – excluding the City of Nottingham. The Board is the key statutory mechanism for agreeing how relevant organisations co-operate to safeguard and promote the welfare of children and ensure the effectiveness of what they do. The work of the NSCB fits within the wider context of the Children and Young People’s Strategic Plan and the Board is responsible for protecting the most vulnerable children and young people, which is a priority set out in the plan. The NSCB works with partners which include Children’s social care, Children’s Trust, Police, Multi-Agency Public Protection Arrangements (MAPPA), Education, Voluntary sector organisations and Faith organisations and the Child Exploitation and Online Protection Centre (CEOP). – Tony Wilkinson, former Chairman of Wilkinsons Limited. The team was coordinated by Adam Pemberton, deputy director of a “capability review team” at the Cabinet Office. It’s worth highlighting the fact that the Child Exploitation and Online Protection Centre (CEOP), which partners with Nottingham Safeguarding Childrens Board, was taken into the newly-created National Crime Agency (NCA) in 2013. Keith Bristow is the 1st Director-General of the National Crime Agency and took up his office in October 2013. In February 2012 ‘Nottinghamshire’s Chief Constable Julia Hodson agreed a compensation settlement after being sued by her former deputy. Mr Howard Roberts was claiming victimisation after exposing wrongdoing by the Chief Constable, under whistleblowing laws. The allegations against Ms Hodson were not made public because the case was settled and will not be heard in court’. Hodgson retired as Chief Constable in August the same year. We can also reveal that a number of Senior Officers in other Police Forces are also under investigation. For example, on 15th September 2014 the IPCC announced that it is investigating the Chief Constable of Wiltshire Police, Patrick Geenty, an inspector and a detective constable from the force in relation to the way they dealt with complaints lodged in 2008 and 2009. Those complaints had been about the way the force handled allegations of sexual abuse. Chief Constable Patrick Geenty is a Common Purpose Graduate. In July this year it was revealed that ‘UK chief constable, Nick Gargan, is under criminal investigation for allegedly breaking data protection legislation to access personal information of younger females whom he’s accused of inappropriately propositioning. Following an investigation by UK police watchdog, the Independent Police Complaints Commission (IPCC), Gargan has been suspended and is the subject of criminal investigation’. Chief Constable Nick Gargan was a speaker at a Common Purpose Event held at Avon and Somerset Police Headquarters. Following the Jay report into the sexual exploitation of young children in Rotherham the IPCC have written to the Chief Constable to advise him of the IPCC’s expectation that any evidence of failures or misconduct by South Yorkshire Police officers should be referred to them. 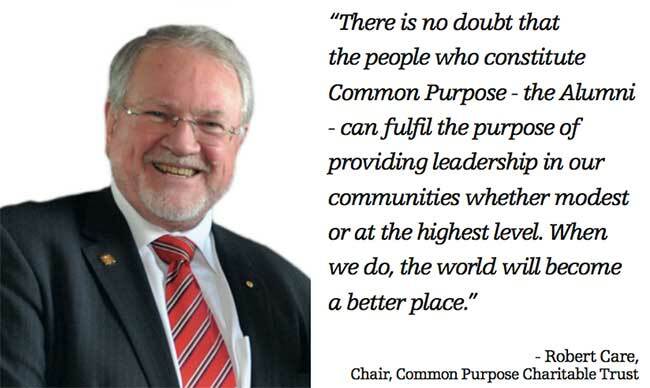 In the ‘Rotherham Common Purpose effect’ published in our previous edition we revealed that David Crompton, Chief Constable of South Yorkshire Police is also a Common Purpose Matrix Graduate as was his immediate predecessor Bob Dyson. Nottinghamshire Police & Crime CommissionerPaddy Tipping was formerly MP for Sherwood who, in 2009, became the 46th MP to step down over the investigation into Parliamentary Expenses. Following the scandal, 112 sitting MPs said they would not be seeking re-election. Before entering Parliament Paddy worked as a social worker (1972 – 1979). From 1979 to 1983 he was Project Leader for the Church of England Children’s Society. Paddy was then a Councillor for Nottinghamshire County Council and Director of Nottinghamshire Co-operative Development Agency and he was also involved with the Nottingham Development Enterprise. Chris Cutland (Deputy Police & Crime Comissioner) previously worked for Nottingham City Council – helping to develop area based community safety working groups which monitored the work of the local police beats and community protection officers. She also has experience of working with locally elected members and stakeholders to identify key issues and how to resolve these. She is a Common Purpose Matrix Graduate 2001. ConclusionThere can be no doubt that the austerity programme introduced by the Coalition Government in 2010 has been a key driver of the accelerating transformation of our public services. This has resulted in the introduction of Local Thematic Partnership Boards which include unelected representatives drawn from the Charity Sector. It is no coincidence that these new governance structures match those outlined in Chapter 27 of the United Nations Agenda 21 programme. Evidence also reveals that these model governance arrangements, where many key positions are held by Common Purpose Graduates, are being replicated all over the Country. This demonstrates ‘beyond reasonable doubt’ that a key function of Common Purpose Graduates is to covertly promote the UNs Agenda 21 programme. How many more such scandals will be witnessed if the Common Purpose Effect remains unrecognised, unchallenged and unchecked? This entry was posted in Article, Links, reblog and tagged 2015, 29 April, Disclosure, Earth, news, spiritual, Spiritual evolution, The Nottingham Common Purpose Effect, UK Column News, World. Bookmark the permalink.